Prepare yourself for a shock. 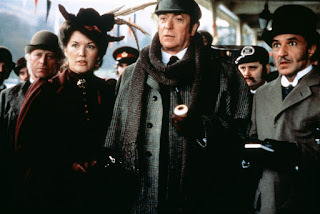 Sherlock Holmes, that fantastic solver of mysteries that baffled Scotland Yard, never existed. It's true! He was the creation of a doctor who wrote the stories during a time when he was awaiting a position with a prestigious medical firm. Sherlock Holmes was the creation of that renowned medical man... Dr. John Watson! 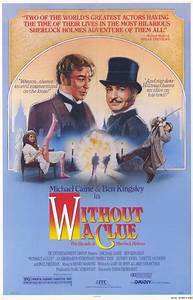 In this entry, Dr. Watson (Ben Kingsley) is a brilliant deductive force who, due to circumstances of his profession, hired an out of work actor, Reginald Kincaid ( Michael Caine), to pose as his friend and supposedly the solver of intricate crimes. 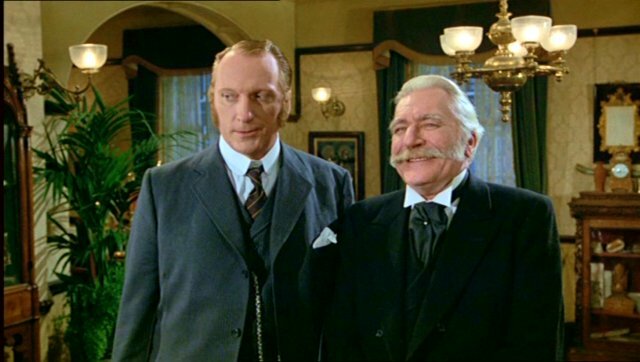 But Kincaid is a bumbling fool who must be coached by Watson in what to say when he is posing as Holmes. Early in the film, Watson, who is finally exasperated to his breaking point, kicks Kincaid out on the street. 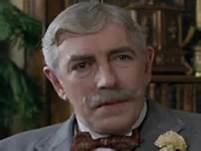 He then approaches his editor, played by Peter Cook, to propose a new series with "Dr. Watson; the Crime Doctor" as its hero. But the editor, as well as the public, will have none of it. It is Sherlock Holmes they want, and as the editor insists, "It is Holmes or nothing". 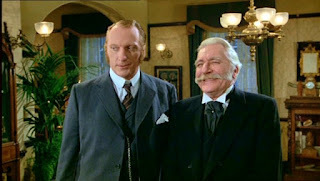 Circumstances are made even more difficult when Inspector Lestrade (Jeffrey Jones) approaches with the Lord of the Treasury, Lord Smithwick (Nigel Davenport), with a serious problem. Someone has stolen the plates used to make 5 pound notes. The economy of the country is in serious jeopardy, and Smithwick only wants Holmes. So Watson is forced to curtail his dislike for the bumbling Kincaid and induce him to come back. 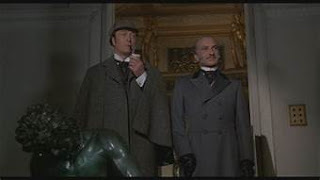 On the trail of the plates, Watson and Holmes investigate Peter Giles, an employee of the treasury, and one of only three people, including Smithwick and his second-in command, who had access to the plates. Holmes and Watson go to a remote village where Giles has supposedly been. After investigating the town and the cottage, everyone, except Watson, believes that Giles and his boatman drowned while trying to cross the local lake in a fierce storm. Watson, on the other hand, is convinced that the culprit is his old arch-nemesis, Professor Moriarty (Paul Freeman). And indeed Moriarty is behind the theft. But to what purposes? On the trail of Moriarty, Watson is apparently killed, leaving the bumbling Kincaid/Holmes as the only source of hope for the country in the retrieval of the plates. 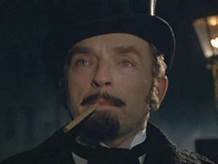 Giles' daughter, Leslie (Lysette Anthony) does not know that Holmes is a fraud and retains hope that Holmes will succeed even after the death of Watson. Or does she? There are a lot of cute little twists and turns in this little gem and spoilers would ruin it, but I will say to watch and not take everything for granted. The two stars of the movie are excellent together. And the movie is quite an entertaining twist on the traditional Holmes narrative. 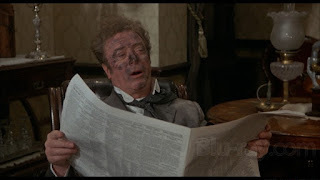 Caine really shines as the alcoholic, bumbling actor pretending to be Holmes. Might I recommend you make this a double feature, pairing it with They Might Be Giants, another movie with a twist on the Holmes story? (That one features George C. Scott as a mental patient who actually is convinced he is the great detective). Well folks, time to fire up the old Plymouth and head home. Drive safely. Great post, loved this film as a kid and great to revisit it again... not heard of the film you recommended but sounds really interesting (worked in mental health for many years) so definitely going to check it out - thanks for joining the blogathon too! Scott stars with Joanne Woodward in the other movie who is a Dr. named Watson. 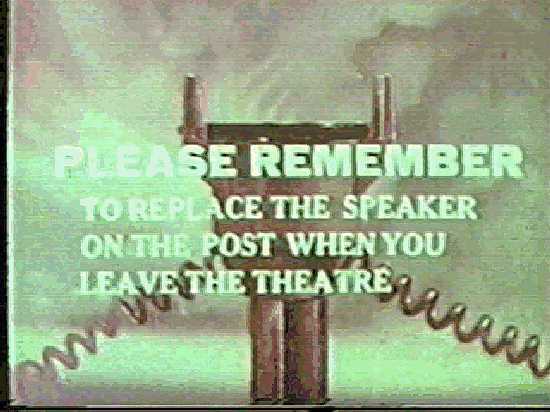 Good luck in finding it on video in its original release form, though. I hear it's pared down some. I myself have only seen it on commercial TV. But this one is a fun one even by itself. Thanks for reading. Without a Clue is a great film but still underrated. They Might be Giants is charming. Thanks for reading. 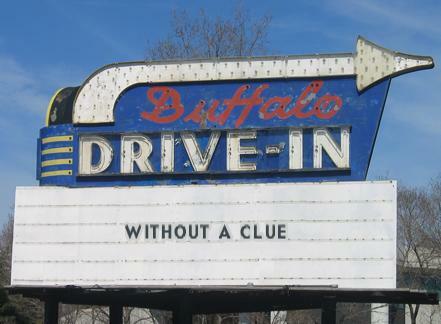 I found Without a Clue on a box set of three Holmes films. From three separate eras. It's interesting to compare the three. How did I ever miss this one? What a cast - Kingsley as Dr. Watson, and the beautiful Lystette Anthony too - she was terrific in the revival of Dark Shadows as Angelique. I wonder whatever became of her. 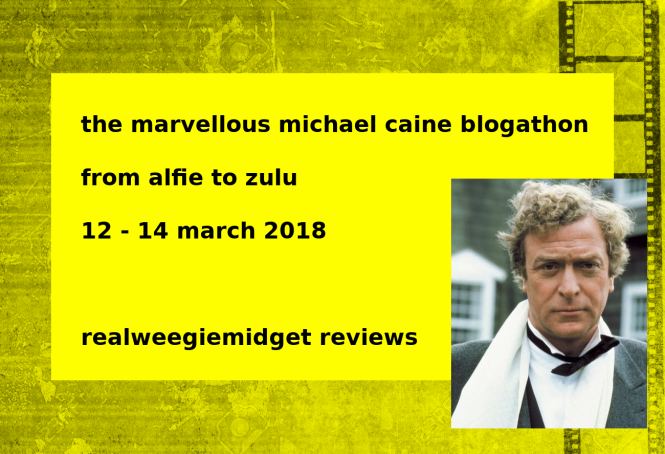 Michael Caine, I am certain, shines as Sherlock. Can't wait to check this one out. It is worth a look. Caine is hilarious. And Kingsley is good too. Thanks for reading. I need to see this again. I've only managed to watch it once, and i slept through the ending because I was 7 months pregnant and suffering from jet lag. But the first 2/3 were very fun, I do remember! Reminds me of my experiences with El Dorado. I wasn't pregnant, but I watched it several times when I was drunk and fell asleep before the ending. Only when I quit drinking did I finally see the whole movie. :-D Thanks for reading. I love this premise – what a fabulous twist on the Sherlock Holmes stories. I need to see this ASAP. Hope you enjoy it. Thanks for reading.